And now the Phoenix bro NEWS! Fall events have reconnected me (and therefore us) with Phoenix brothers LIVE and In PERSON! Yes, it's true. I have actually rubbed old achy shoulders and raised a wavering glass or two with brothers in the flesh, and what a great treat for all of us. Many laughs, memories, and catching up. 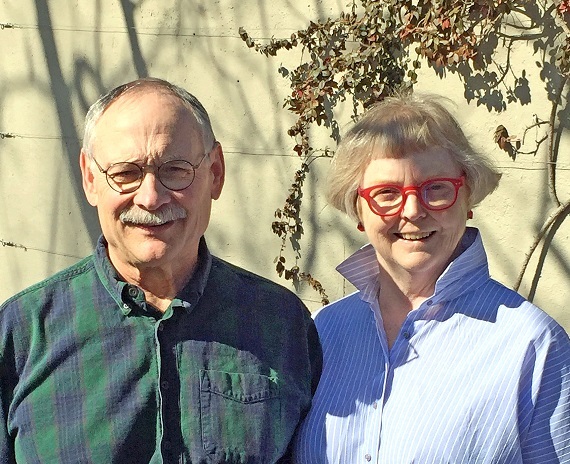 After reestablishing contact (Pete and Marion had attended our 45th Reunion), we hit on a plan for Jill and I to drive to their house, spend the night, drive with Pete to the Met's game mini-reunion, return and spend another night, and then head home. It was a really great way to catch up. Pete's goal is to retire in February and then take a 3-month hiatus to the sights and wonders of New Zealand. First Marion has to complete a book she's writing for Oxford University Press, and Pete has to clear his desk. a much harder task than Marion's. Pete promises a detailed write-up, but they arrive for a week's vacation on Hilton Head this Sunday, so maybe we can nail it down together. With Paul's wife Alyson and Dave's wife Margo, we were alternating between catch-up news and the stirring Big Green comeback. 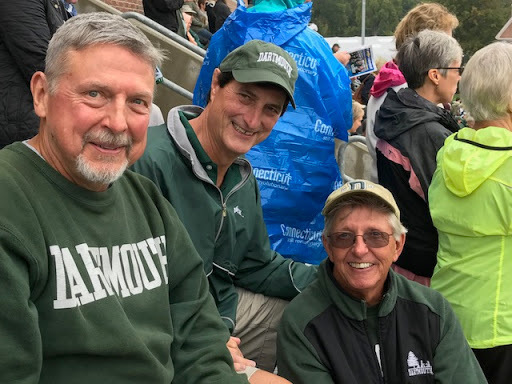 Lots of high fives, and maybe some hugs, and then a very boisterous and dubiously pitched group singing of "We of Dartmouth" led by the football players. We met up again at Murphy's bar to laugh and relive the happy, happy days of the Kleen laundry truck (Paul was Boss Man) and house shenanigans. Can you tell from the picture how sleek and athletic Addo appears compared to the earlier picture sent in my Paul? He's been on a running, exercising, eating regimen, which puts us all (well, maybe not hiker Don Cole) to shame. Looks GREAT and is just as engaging and humorous as ever. Drat! I'm pretty sure we took pictures in Murphy's so I could show off the trophy 2nd wives (haha, just kidding - wonderful ladies who keep these dunderheads in line). So many laughs, such little time. Know that both SWEAR they will be attending our 50th Reunion. I think I cemented the deal by awarding them with the rare and coveted 6D9 ball caps that had been produced for our 40th reunion. I'm wearing a very faded version of mine in the pic. There are a number of leftovers for sale at $10 each. Commit to the 50th and MAYBE I'll send on to YOU. Maybe. Saving the best (very subjective rating), I somehow managed to bring Hanford Auten III out of his NH hermitage and to our post-bonfire gathering in the Hanover Inn. Actually, it was no great feat on my part. Skip and I had been taking by phone and TRYING to exchange pictures, but his woefully lame excuse that his cell phone signal would not transmit his pics from rural NH turned out to have a ring of truth. So, here struts in some amalgamation of Colonel Schweppes, Max von Sydow, and Captain Kangaroo and announces he is indeed Skip Auten. I was quite envious of his professorial beard and he my SC retiree tan. Of course what we actually saw in each other were two shaggy 20-yr olds hanging around the Phoenix basement jukebox. Skip has quite the Walter Mitty-like story. I wish he would tell it directly because I keep messing up the sequence, dates, and people. It goes roughly like this. Soon after graduation he was drafted by his NH Draft Board. Before reporting, the lottery numbers came out and his number was quite high (I think in the 300's). He appealed his drat - appeal denied. Given something of a choice, he chose Army artillery. Yes, WTF, but there must have been a reason. Served in Nam, was "slightly wounded," returned intact and spent five years in Burlington. All he would say about those years is that he eventually realized he would wind up dead or in jail if he continued. So, naturally he did what any red-blooded, nearly able-bodied but mind-numbed Nam vet would do: he went to law school. He started a career as a small town lawyer in private practice. I think the period was about seven years...and he hated it. BUT, when the opportunity to work as a legal advocate for abused children (something like that), he embraced and loved it. Forget for how many years, but then budget cuts ended the position. So naturally he did what any middle-aged, adaptive Dartmouth man would do: he became an electrician's apprentice, also dabbling in plumbing. I think that was next, but in there somewhere is becoming an EMT, and then due to his talent, ambition, popularity or lack of other suitable candidates, became Fire Chief of his town. BUT THAT"S NOT ALL! When the couple running the area's general store chose to retire and no buyers or family would take it over, a motorcycle gang determined in would make a great HQ for them. Not sure if this was a Sons of Anarchy branch or portly IBM salesmen tricycle group, but he town didn't like the prospect. The decided to declare it a state historical site, but there was a requirement that it had to be kept operation. So, good ol' Skip stepped up with second wife Gayle, an immensely talented gal in the antique doll and furniture miniatures trade, to run the general store. I don't know if the town was their homestead of South Acworth or close by. It's hard to tell in this beautiful rural area southeast of Claremont and northeast of Bellows Falls. I had to visit, so with GoogleMaps and Skip's instructions, I made it down there on the Sunday after Homecoming. What a beautiful farmhouse, built in the late 1700's and expanded over generations, the plot of land upon which they have built and nurtured a substantial vegetable garden and more, I imagine, probably all legal, but...). 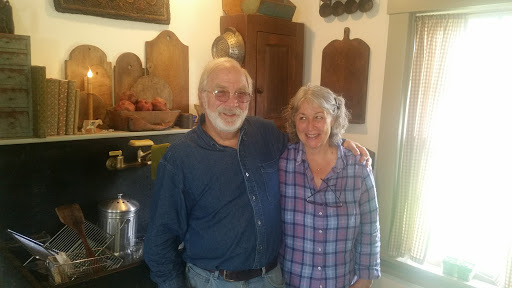 I didn't have much time before my flight out of Manchester, but Skip and Gayle fed me his homemade onion soup and bread, and I got a tour of the house with their respective workshops, and was charmed into total ooziness by it all. WONDERFUL. Skip says Gayle chose the location because it was the closest environment look and feel to her beloved Vermont! Really, really love the arduous task I have assigned myself to catch up with you bums and drag career, home life/family, and stories out of you. I've been promised write-ups from Pete and Mike Kearney. I got brief and totally unsatisfactory emails from T. Dwight, Vito, and Carl. Enjoyed a too-brief cell phone conversation with Tower. They owe us pictures, details, and their memories. Ditto a 45-minute conversation with Gregg Cook, who also has a fascinating story of what he did and where fate and initiative took him. There won't be any stories from Tim Rosenhan and Tuck Miller. They're dead. That's an intended bucket of ice water and slap on the face to WAKE UP. 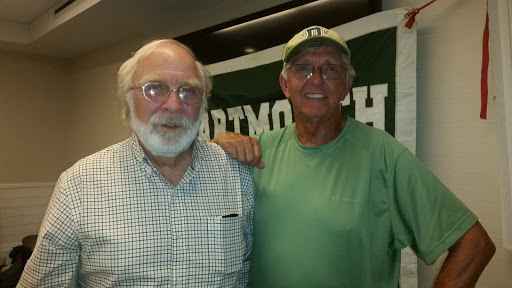 Commit to coming to ur 50th Reunion and communicate with us Phoenix brothers NOW! My parents had a wooden inlay plaque hanging in our hall that we saw (or ignored) every day. My middle sister has it now. It says, "Enjoy yourself - It's later than you think." Sharing your life's story with your brothers, and seeing them again after 50 years have tossed and blown us about on life's seas and lakes, will bring you a pleasure and contentment you may not appreciate until you make the attempt. I GUA-Ran-TEE!